A heated debate has erupted around the newest exhibit at the Holocaust Memorial Museum in Washington, D.C., with impassioned and inflammatory rhetoric flaring up on both sides. For the past several days, protestors have been harshly condemning the museum for its polarizing decision to display a film of the infamous 42-minute drum solo that Hitler played to apologize for the Holocaust. Yikes. It looks like this has all the makings of a major controversy. According to a statement from the Holocaust Museum in Washington, D.C., the controversial video of the drum solo, which Hitler performed in 1945 as an apology for the Holocaust, is a vital historical artifact, crucial for a more complete understanding of the Nazis’ horrific actions. Jewish activists, however, have clashed with the exhibit’s curators and say that a surround-sound audio-visual display of the reviled German dictator going absolutely balls-to-the-wall on a 20-piece drum set in an attempt to atone for his crimes against humanity has no place in a museum primarily intended to commemorate Hitler’s victims. Enraged protestors have argued that the video, which begins with a 56-year-old Adolf Hitler sitting at a drum set and saying, “I hope this makes up for the big mess I’ve made,” in German before launching into a masterful 42-minute drum solo, unjustly provides a platform to one of history’s greatest monsters as he attempts to assuage his own guilt for orchestrating the genocide of millions of innocent people. They have condemned the museum for displaying even one snare hit of Hitler’s apology drum solo, let alone a full 42 minutes of Hitler quickly alternating between high-tempo drum rolls and complex cymbal tricks. In response to this criticism, representatives of the Holocaust Museum, and many of their vocal defenders, have argued that merely displaying Hitler’s acrobatic drum solo is not the same as accepting the drum solo as a suitable apology for the Holocaust. They have also suggested that moments in the video such as the one when the reviled German dictator plays an entire 10-minute section in triple time, or keeps the beat with a drum pedal while using his hands to spin his sticks, provide museum goers with crucial historical context. 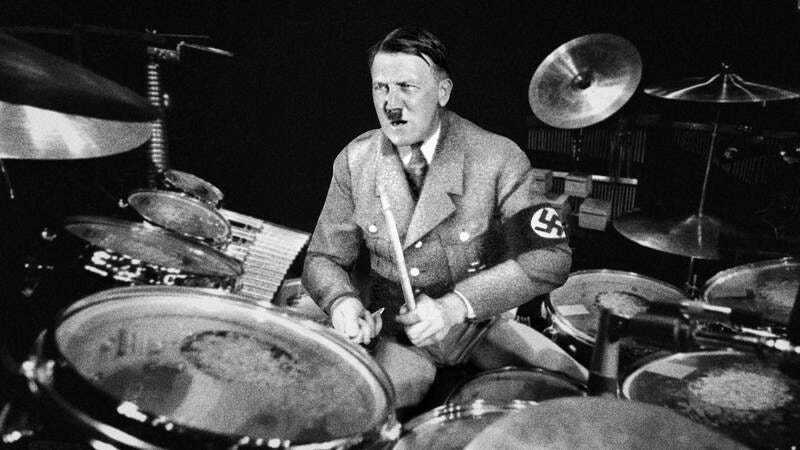 As of today, the museum has opted to keep the video of Hitler’s drum solo on display in its entirety, including its controversial ending in which Hitler plays a blistering finale, the Third Reich leader making full use of every drum and cymbal in his truly epic set before standing up, kicking over his bass drum, and throwing his drumsticks into the audience. While no one is sure how long this exhibit will stay up, it’s clear that the media firestorm around Hitler’s final drum solo isn’t going to die down. While it’s possible to sympathize with the Holocaust Museum’s desire to display such an important piece of history, the wave of backlash it’s facing might be a sign that, in the end, this somber memorial to a horrific genocide might not be the best environment to show the apology drum solo from the monstrous dictator who is responsible.